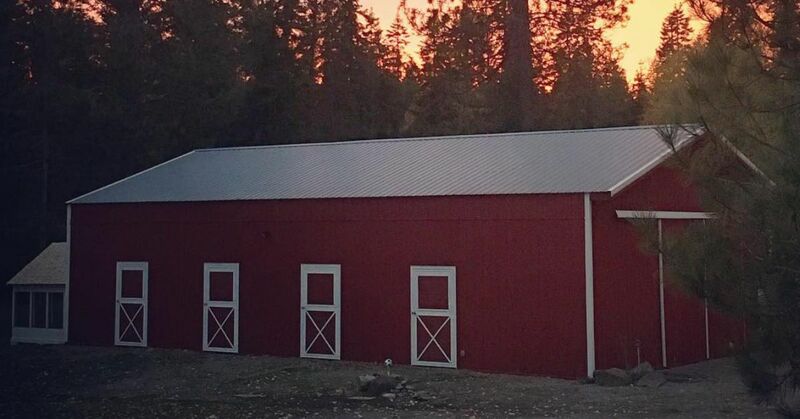 Tammy is the creative mind behind @lavenderbrookfarm, where she shares her adventures in decorating her family's red barn farmhouse. An expert DIYer and home stylist, Tammy is constantly tweaking and redefining the space, which boasts a roomy layout and expansive open floor plan. Inside, a bright and airy palette is finished with unique touches, antiques and uncommon DIY projects (such as a striped tea towel turned pillow cover). Textural accents and cozy layers make the home feel warm and welcoming, despite the temperature outside. White shiplap siding makes a statement in the entryway. An antique black bench serves as the anchor for an array of rotating artwork and inspirational calligraphy. Exposed beam ceilings add to the farmhouse charm in the kitchen, which is outfitted with white cabinetry, dark bronze hardware, and stainless steel appliances. The roomy island doubles as a coffee bar with two stools pulled to the side. Next to bright double French doors, a roomy hutch houses a collection of antique accessories and china. A distressed rug anchors a vintage table and chairs in the eat-in dining area. Wood shelves high on the wall display collections of vintage earthenware and ceramics. A large sectional sofa offers a comfy place to lounge in the living space, which features a large area rug. Wicker baskets under the coffee table add discreet storage, and layers of plushy throw pillows and knit blankets bring warmth and texture. Behind the sofa, a large buffet cabinet offers storage while displaying an antique rocking horse and clock. Across from the sofa, the fireplace offers year-round warmth with a brick surround and a white mantle, a blank palette for styling each season. A cozy armchair is the perfect place to curl up next to the fire and read a book. A sisal rug anchors a large farmhouse table in the formal dining room, surrounded by wicker armchairs. A stainless steel chandelier hangs above, and a large sliding barn door completes the farmhouse aesthetic in the room. Tammy renovated the laundry area to create a space that was both beautiful and functional—complete with room to sort, fold, hang, and organize laundry. The main statement, of course, is the bold patterned tile on the floor. An antique windowpane ably displays floral artwork in the master bedroom, where layers of textural white bedding create a luxurious sleeping environment. The master bathroom offers a relaxing oasis with a whitewashed tile tub surround and wood-look chevron flooring. Memories from the family's travels decorate the shelves, including sand collected from Mexico to Alaska displayed in vintage bottles. By painting the cabinetry a soft gray and installing white shiplap siding, Tammy completely transformed the spare bathroom. New dark bronze hardware and complementary faucets complete the look, finished with bison artwork by Jenny Fowler.